Customer-facing channels are continually changing, and it’s important for brands to keep their messaging consistent as those channels evolve. That continual evolution of display technology and addition of other channels poses a challenge for content deployers. 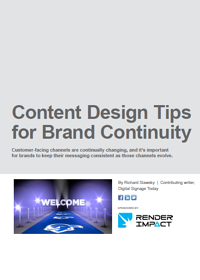 When developing content for new media, how does a brand ensure continuity in their messaging efforts?